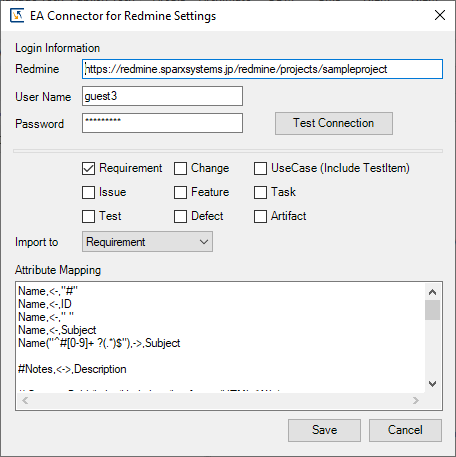 With EA Connector for Redmine, information in both Enterprise Architect and Redmine can be easily converted to one another. EA Connector for Redmine is an add-in tool to connect elements in UML Modeling Tool Enterprise Architect with Redmine tickets and convert their attributes bidirectionally. Enterprise Architect elements include Requirements, Changes, Use Cases, Test items, Issues, Features, Tasks, Tests, and Defects. EA Connector for Redmine is an add-in for Enterprise Architect. About Attribute Mapping see Attribute Mapping. Run Enterprise Architect and open a project. Select "SPECIALIZE Ribbon | Add-Ins | EA Connector for Redmine | EA Connector for Redmine Settings" to set and save the following items. Select an element, such as a requirement, and then select a desired action from the context menu "Specialize | EA Connector for Redmine". Select an Enterprise Architect diagram, and then select a desired action from the context menu "Specialize | EA Connector for Redmine". Select a package, and then select a desired action from the context menu "Specialize | EA Connector for Redmine". 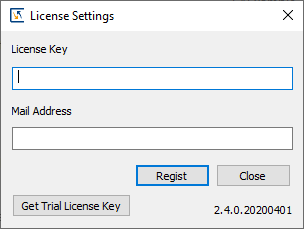 For Floating Licenses, Enterprise Architect 11.0 or higher, Sparx KeyStore Manager 2.2 or higher. In the floating server config file, if option AUTHMETHOD value is AM_ACTIVEDIRECTORYEX or AM_SSKSGROUP, you can not use EA Connector for Redmine. EA Connector for Redmine uses IE(Internet Explorer)'s proxy setting. If you use a user authentication proxy server, please download file in the the following URL, rewrite the file contents, and set them to registry. 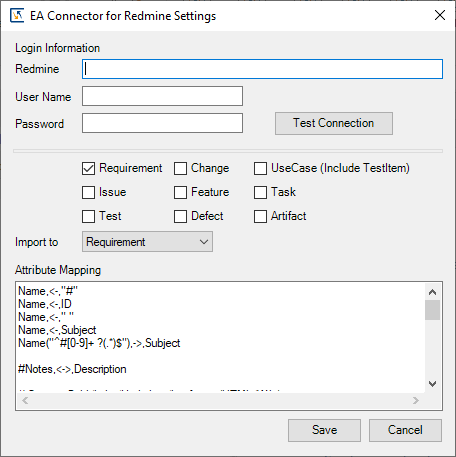 EA Connector for Redmine uses Redmine's Rest API/Basic authentication. We use BitNami::Redmine 2.0.2-0/2.1.6-0/2.2.1-0/2.3.1-3/2.4.2-0/2.5.2-3/2.6.3-0/3.0.1-0/3.1.0-0/3.2.1-0/3.3.2-2/3.4.6-0/4.0.1-0 Windows to test EA Connector for Redmine.